From spiking a heady seafood broth to scenting delicate sweets, I love the unmistakable fragrance of saffron. 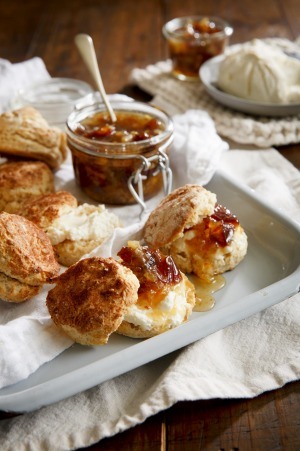 This is a pretty classic scone recipe with a delicate lacing of saffron that just goes so well with the exotic, sweetly sour marmalade and tangy, creamy labna. 1. It's best not to refrigerate the marmalade, just keep it in a sealed jar somewhere cool. 2. You can omit the saffron (no need to heat the milk either) for a classic scone recipe. 3. Using a knife to bring the dough together gently helps to keep the scones light, and ensures that they rise properly. 1. To make the labna, spoon the yoghurt into a strainer lined with muslin or a clean dish cloth, and place over a bowl in the fridge for 24 hours. 2. For the marmalade, slice the lemons into 3mm rounds and remove the seeds. Cover with boiling water and steep overnight. 3. Preheat the oven to 200C fan-forced. 4. For the scones, warm half the milk in a small pot, add the saffron, and set aside for five minutes. Mix the remaining milk with the cream, and add the saffron-infused milk. 5. Sift the baking powder and flour into a large bowl. Rub the butter through the flour with the salt until well mixed. Make a well in the centre and pour in the milk mix. Mix together using a knife to form a rough dough. Turn out onto a floured benchtop and knead twice only. Gently pat into a flat round with your hands until about five centimetres thick and cut out the scones with a small circular cutter. Carefully bring the scraps back together and cut out the remaining dough. 6. Preheat a baking tray in the oven for five minutes. Lightly flour the tray and arrange the scones close together but not touching. Brush the tops with a little milk and bake for 12 minutes, or until risen and lightly golden. Cool on a wire rack. 7. For the marmalade, drain the lemons and add to a wide-based pot along with the lemon juice, sugar, cinnamon and 500ml of water. Cook so that the liquid is just ticking over for around an hour. It's done when the pith of the lemons is translucent. Remove the marmalade from the heat, lift out the lemon slices and cool a little before cutting into small pieces. Return to the pot along with the dates and bring to a simmer. Take off the heat and stir in the orange blossom water. 8. Remove the yoghurt from the fridge, discard the whey and tip the labna into a bowl. Stir through two teaspoons of orange blossom water with a pinch of salt. 9. Serve the scones with the marmalade and labna.